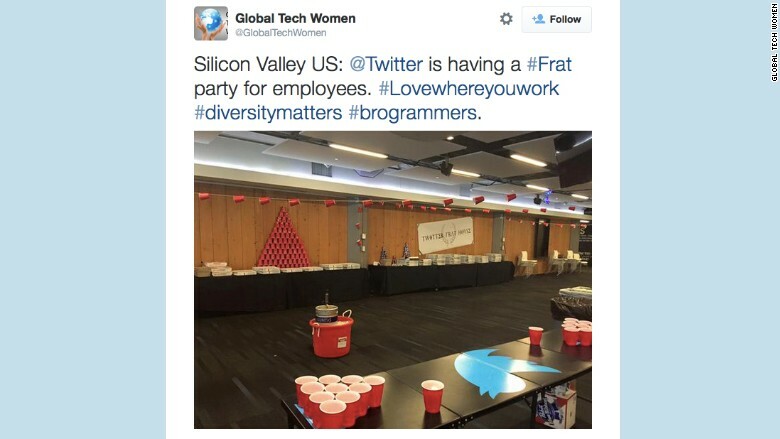 The Global Tech Woman group shared a photo of Twitter's frat-themed party after an employee tweeted and then deleted the image. Twitter has apologized for hosting a fraternity themed party. A photo shows the red happy hour event, complete with red Solo cups, a keg, a table set up for beer pong, and a sign that reads "Twitter Frat House" in Greek lettering. "This social event organized by one team was in poor taste at best, and not reflective of the culture we are building here at Twitter," said Twitter (TWTR) spokesman Jim Prosser in a statement. "We've had discussions internally with the organizing team, and they recognize that this theme was ill-chosen." The party's existence first was made public when a female Twitter employee tweeted the image of the event. She deleted her tweet, but not before the photo was picked up and posted by the Global Tech Women group (along with the hashtag #brogrammers). While Prosser said he couldn't confirm what team threw the event, Fusion reported that the party was hosted by Twitter's revenue team. Silicon Valley has been in the spotlight for a lack of diversity recently, especially in technical positions, and the poor choice in party themes comes at a particularly bad time for Twitter. The firm is currently in the middle of a gender discrimination suit. Former employee Tina Huang has accused the company of not promoting female engineers. Her complaint says at least 50 other women have been affected by Twitter's "subjective, secretive promotion process." She is pushing to make it a class action suit.